Happy Friday and Happy Birthday to two of my siblings! It is both my brother and sister's birthday today. They are not twins they are actually three years apart in age exactly. So I am taking my sister to lunch today and made her a shaker card that is not shaking to freely. I should have listened to the queen of Pretty Pink Posh Paulina Nakamura when she suggested a double layer of foam to allow the sequins to move easier! I will just need to tell my sister not to shake her shaker card. She won't likely listen to me, she rarely does--lol. I finally used Lawn Fawn Year Four birthday and did a little Copic colouring. I was so excited to use the dies, but I didn't want to put anything else inside the shaker to block the sequins from moving freely. This is too cute Tracey. I love that sweet little birdie. CUTE card Tracey, your sister will love it!! Happy birthday wishes and blessings to both, enjoy your lunch! oh my gosh this is just too cute! Happy Birthday to your siblings!! My Dad and his Sister are the same way ... both born on July 9th -- one year apart! LOL!!! Toooooo funny! I loveeeeeeeeee this!! Tooooooooo cute cute cute!!!!! Have a great weekend =] Michele F.
This is darling. 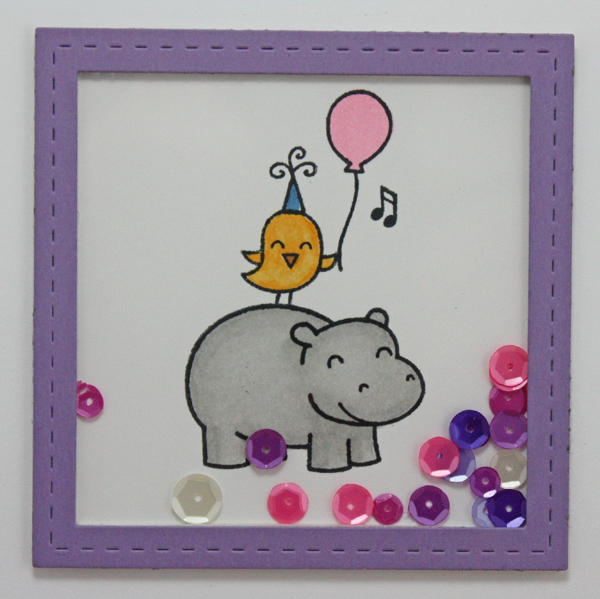 I love the purple frame and the stamp is so cute. I LOVE this! Absolutely super adorable! I'm sorry it's not shaking so well, because it certainly is cute. I have finally gotten all my parts for Year Four and can't wait to use it. Thanks for the so cute idea. Who can resist shaking a "shaker" card? How funny that your brother and sister were born on the exact same day! Did they hate sharing their special day when they were younger? Love the card and I bet your sister will too. This is darling~such a fun sequin shaker! What a coincidence on the birthdays~very cool. Happy Birthday to your family.. that is cool they share a birthday.. I actually have my new nephews that share a birthday too.. they are 4 years apart. This shaker card is awesome..
Adorable card Tracey! I love that sweet image. Happy Birthday to both of your siblings. Cute card and happy birthday to your brother and sister! I made my first shaker card the other day and my sequins weren't moving around too freely either, so I'm glad for the tip about the double layer of foam tape! What a popular day for birthdays! I love your super sweet shaker card, Tracey! It's perfect! Happy birthday to your brother and sister; how cool that they share the same date! Now this shaker card is a cutie patootie in every way! Your sister will be delighted! Super sweet!! 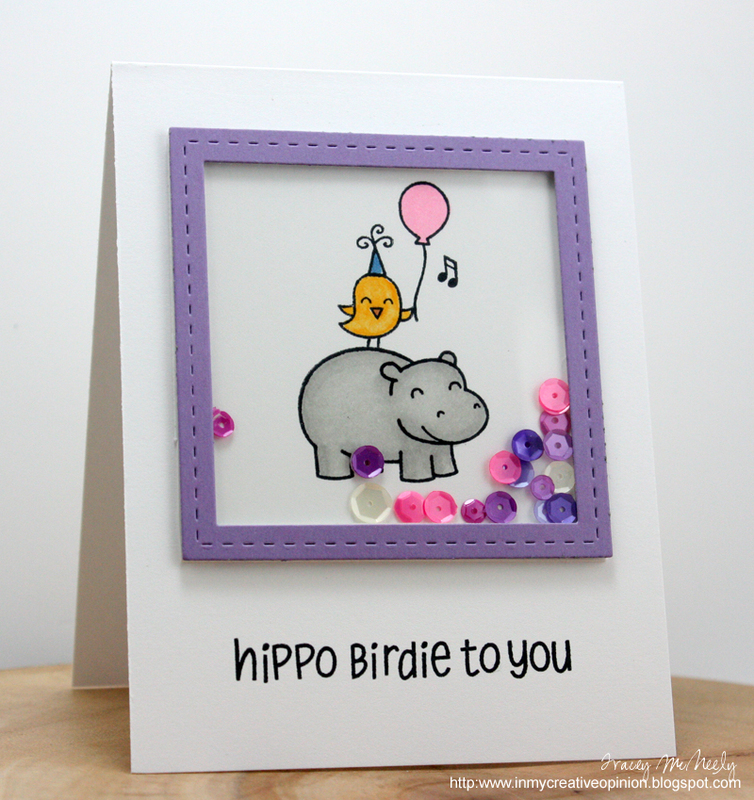 This is so very adorable, and a super cute way to do a shaker card. I love the colors, and the way that your image is actually inside the shaker. Hope your sister doesn't try to shake, but you know she will--sisters are like that, and I'd do the same to my sister. How adorable! Bet your sister loved this, Tracey! Adorable card Tracey! Such a cute little image! Love the shaker featuring all the sequins! Tracey...this is just too darn cute! I love your sweet little critters. Happy Mother's Day! Awww! Super cute and festive! Love the pink and purple sequins! Very cute shaker card, Tracey! Super cute shaker. Love all the different colors of sequins you used. One of my favorite of the newer LF sets, such a sweet shaker! I don't know how I could have missed this adorable shaker card! I LOVE your choice of stamps and all those beautiful spring colors of sequins...so fun! I love this! It is so cute!! !